The gentleman’s name above is Antonio Minichiello. Antonio is the chef at Verandah — the three-meal-a-day restaurant at the Four Seasons. …that’s sort of an Italian take on the Philly cheesesteak (or at least that’s the way he explained it to us….with a twinkle in his eye, I might add). …and astonish you with the delicacy of the pasta. …that might be the crispiest, creamiest things I’ve ever put in my mouth. Your biggest problem will be trying to resist the urge to eat all of them at once. Just as your biggest regret will be not paying more attention to this restaurant and this chef until now. Because the dinner menu at Verandah is a serious steal, and Minichiello is a serious talent. You know it has to be good, because no one on god’s green earth is more bored with Italian food in America than John Curtas. And if a chef’s food can make us sit up and take notice like his did, you know it’s got to be something special. 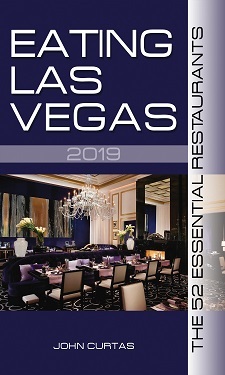 So, like on many other occasions, Eating Las Vegas is alerting you first to this phenomenon…so you can enjoy it before the hoi polloi overruns the place. Hold On to Your Fedoras! EAT is Open! Please don’t tell me you ate those beets…..
White Bolognese (ragu’ bianco) brings back memories when I was working in Italy: at the Modena “Autogrill” service station on the freeway you could get a dish of tortellini with ragu’ bianco and a glass of Lambrusco for 7000 Italian lire (about 4/5 US dollars). ELV responds: All portions were reduced in size at our request to enable us to taste a larger variety of dishes. @ Tom:The portion are not that small at all and as John Curtas confirmed they were reduced at their request..Verandah is a place to dine and enjoy..if you’re looking for a fine, exquisite dining experience then Verandah is the place for you, if you’re looking only to stuff your belly then go to a fast food chain restaurant..there are many along Las Vegas Boulevard!! !